“It is possible to invent a single machine which can be used to compute any computable sequence,” twenty-four-year-old Alan Turing announced in 1936. 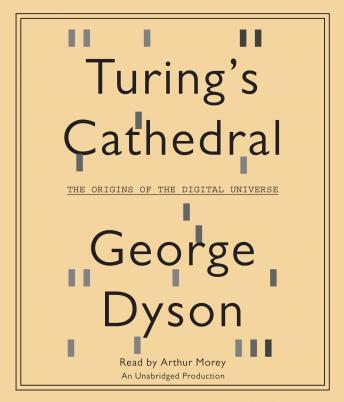 In Turing’s Cathedral, George Dyson focuses on a small group of men and women, led by John von Neumann at the Institute for Advanced Study in Princeton, New Jersey, who built one of the first computers to realize Alan Turing’s vision of a Universal Machine. Their work would break the distinction between numbers that mean things and numbers that do things—and our universe would never be the same. Dyson’s account, both historic and prophetic, sheds important new light on how the digital universe exploded in the aftermath of World War II. The proliferation of both codes and machines was paralleled by two historic developments: the decoding of self-replicating sequences in biology and the invention of the hydrogen bomb. It’s no coincidence that the most destructive and the most constructive of human inventions appeared at exactly the same time. How did code take over the world? In retracing how Alan Turing’s one-dimensional model became John von Neumann’s two-dimensional implementation, Turing’s Cathedral offers a series of provocative suggestions as to where the digital universe, now fully three-dimensional, may be heading next.